With the « direct to disk » engine, Streamosaur could record unlimited broadcast (depending of your hard drive free space), in wav file format or mp3. 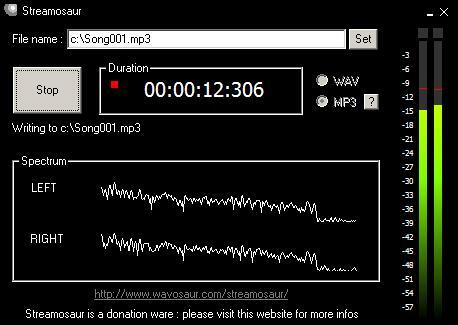 To use mp3 encoder it’s necessary to setup the lame mp3 encoder: for that follow the instructions described in https://www.wavosaur.com/streamosaur/setup-mp3-encoder.php. Streamosaur is a completely portable software without entries in registry. Streamosaur doesn’t need installer: unzip the file in a directory and launch the exe file. Note that Streamosaur is donationware : donate to support the development : more features, bug corrections and more ! streamosaur records, saves, plays, but does not sound! How To Bypass Vista Limitation?